A Massachusetts divorce lawyer yesterday launched Massachusetts Divorce, an app for the iPhone and iPad that can be used to calculate alimony and child support under Massachusetts law and then generate a court-ready form. It can also be used to calculate dates. The app was created by lawyers from the Infinity Law Group, a law firm founded by Gabriel Cheong, a lawyer who is known in the state as a frequent speaker on law practice management and technology. 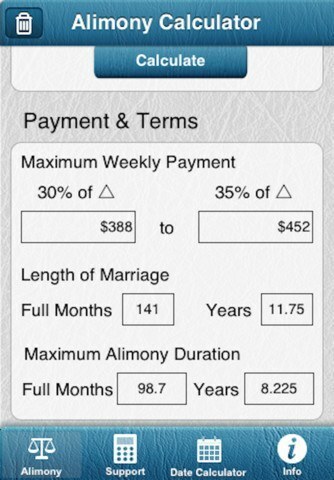 Alimony calculator, to determine how much alimony must be paid and for how long. Child support calculator, which will calculate child support based on the Massachusetts Child Support Guidelines. Date calculator, to determine the duration between two dates or to calculate the time for the court to issue divorce judgments. With the child support calculator, once you have entered the numbers, the app enables you to export the results into a PDF version of the court-approved child support form. You can then print the form using air print, email it or export it to Dropbox. The app is compatible with iPhone and iPad. It costs 99 cents. When I tried it this morning, the app functioned as described, except for one glitch — I could not export the child support form to Dropbox. Although my Dropbox account tells me that it recognized the app, when I tried to export to Dropbox, I received a message, “Failed with error.” I was able to email the PDF to myself. The description of this app in the iTunes store describes it as the first comprehensive app for divorce calculation in Massachusetts. A search of the iTunes store indicates that there is another app, L.P.T. Family Law, that describes itself as a “Massachusetts family law resource tool that includes statutes, calculators, case law, forms, and court directories.” I have not tested this app, which also has an Android version. Another available app calculates child support only.